Hey everyone! Here’s the first hair tutorial of 2014!! I’m really excited because one of my resolutions for this year is to do more beauty/hair tutorials. I always like to start the New Year by trying a new and different hairstyle. I have never worn my hair like this, so it was definitely a challenge…a fun challenge. In the 60s, it was all about volume whether you were wearing your hair up or down. 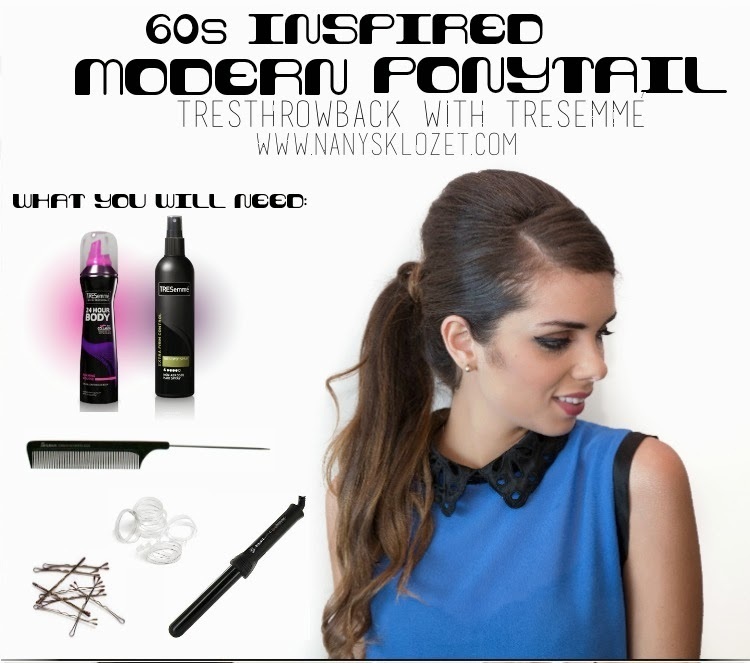 As part of my “Throwback Thursday” series with TRESemmé, I’m going to show you how to create a 60s-inspired ponytail. A flat iron or curling iron. 1.Wash your hair the night before. If you hair is straight, let it dry naturally; if your hair is curly or wave, blow dry it focusing on the roots. 2. Part your hair to your side of preference. 3. Apply TRESemmé 24 Hour Body Foaming Mousse; this lightweight mouse will boost your hair’s body and give you maximum hold. 4. Part the hair; section off a big part of hair on top of the head. 5.Split that section in smaller parts and start teasing the square section with the tailcomb. Push the hair down carefully to avoid breaking the hair. (Quick tip: secure the rest of your hair so it doesn’t get confusing). 7. Use a bobby pin to hold the beehive into place. 8. After that, gather the rest of the hair together. You can make the ponytail as high or low as you want. We are going to make it a little low to emphasize the volume created at the crown. 9. Use hairspray and a brush to smooth the ponytail as much as possible. 10. Grab a piece of hair to wrap around your ponytail, covering up the elastic used. 11. Now we are going to give the ends of your hair a cool texture. This can be easily done with a curling iron or a flat iron. I hope you enjoyed this tutorial. For more hairstyles, check out TRESemmé’s YouTube. Don’t forget to share your throwback look with TRESemmé and me by hashtagging it on Instagram and Twitter with #TRESthrowback #TBT Follow me on www.nanysklozet.com or on Instagram as @Nanysklozet.